Today we will be looking at another unique ceratopsian. Check out Wendiceratops pinhornensis! Wendiceratops was a plant-eating dinosaur that lived in what is now Alberta, Canada, during the Late Cretaceous Period, between 78 and 79 million years ago. From beak to tail, Wendiceratops measured about twenty feet long. The genus name translates to "Wendy Horned Face", honoring Wendy Sloboda, the fossil hunter who first discovered this dinosaur's bones, and the fact that it had at least one horn on its face. The species name, phinhornensis, is in reference to the Pinhorn Reserve, the area of land on which its bones were unearthed. As stated above, Wendiceratops was a ceratopsian dinosaur, characterized by having a curved beak, horns, and a frill. More specifically, it was a member of the centrosaurine ceratopsian family, charcterized by their thick snouts. Other centrosaurine ceratopsians were Pachyrhinosaurus, Styracosaurus, and Nasutoceratops. 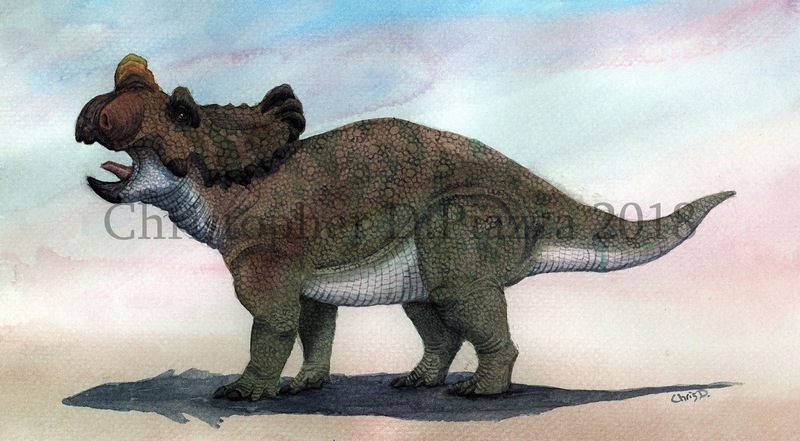 Wendiceratops life reconstruction in watercolors by Christopher DiPiazza. I opted for small brow horns as guesswork since that part of the skull has yet to be found. Wendiceratops is interesting because its initial discovery in the earth, its study and description, scientific publication, and eventual display at the Royal Ontario Museum, all took place in Canada. It was a truly home-grown fossil discovery! Photograph of Wendiceratops' frill horns from Evans' 2015 paper. Wendiceratops is known from several partially complete individuals. Among those individuals we can piece together a decent idea of what this ceratopsian looked like. Most striking about it was the eight horns that grew from the top of its frill. These horns curved forward and downward, covering the top front portion of the frill. Forward-curling frill horns aren't previously unheard of in ceratopsians. Vagaceratops, and its relative, Kosmoceratops, had horns like that too, however they were from a different branch of the ceratopsian family tree, the chasmosaurines. This means that forward-curling frill horns evolved at least twice within ceratopsian dinosaurs. Chasmosaurines vs Centrosaurines! To be fair, all of these ceratopsians didn't coexist at the same time, either. Wendiceratops also sported a nose horn, but it wasn't pointed, like that of Styracosaurus, but rather flattened laterally. Sadly, the section of the skull that would have included the brow horns was never found, so we still don't know what they were like, or if they were there at all. The purpose of all this ornamentation on the frill is still mostly a mystery, but it is likely that these horns were used for interacting with members of the same species. It is even possible that males and females had different shaped or sized horns. 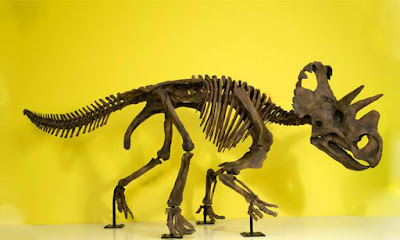 Wendiceratops skeletal mount on display at the Royal Ontario Museum in Canada. Note this reconstruction sports long brown horns. This is guesswork since brow horns were sadly never found. Like its relatives, Wendiceratops had a very deep snout with a large nasal cavity. Its beak was curved and backed up by many rows of small teeth that were ideal for shearing plants. Beyond the skull, Wendiceratops was also found to have a uniquely shaped ischium. The ischium is the backwards-facing bone at the bottom rear of a dinosaur's pelvis. Wendiceratops' was wider and more rectangular at its tip, which is previously unknown in centrosaurine ceratopsian dinosaurs. Evans, David C.; Ryan, Michael J. (2015). "Cranial Anatomy of Wendiceratops pinhornensis gen. et sp. nov., a Centrosaurine Ceratopsid (Dinosauria: Ornithischia) from the Oldman Formation (Campanian), Alberta, Canada, and the Evolution of Ceratopsid Nasal Ornamentation". PLOS ONE. 10 (7): e0130007. Ryan, M.J.; Holmes, R.; Mallon, J.; Loewen, M.; Evans, D.C. (2017). "A Basal Ceratopsid (centrosaurinae: Nasutoceratopsini) From the Oldman Formation (Campanian) of Alberta, Canada "Canadian Journal of Earth Sciences. 54. I'm too sleepy right now to go to my timeline references - what tyranno's and other carnivorous varmints were contemporary with this animal that might have snacked on it? Daspletosaurus is known from the same formation but I don't know if it was a few million years shy of Wendiceratops' time or not.